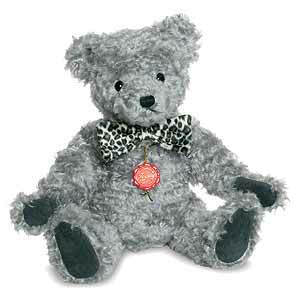 Teddy Hermann Weston Bear, fully jointed and made of the finest wavy grey mohair. Limited edition of only 300 pieces worldwide. His bow is attached by ribbon and is removable. Product details: Safety eyes, synthetic filling material, Growler. Size 40cm tall.